Today we take more snaps than ever before. Cameras are now part of our everyday life, so it’s never been easier to gather impressively huge collections of photos of everything and everyone important to us. Collecting these photos together in a collage is the perfect way to display your lifetime snapshots, and with the remarkably simple ability to share your creations you can deliver little doses of happiness and memories to everyone. Here are some of the best collage making software available to make collaging easier and more rewarding. Picture Collage Maker is a powerful program by PearlMountain that’s ideal for creating collages and scrapbooks of your photos. 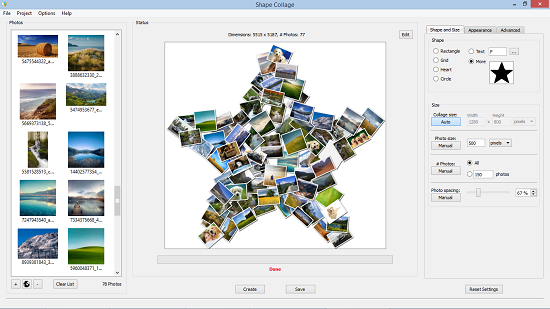 It’s suitable for use with Windows or Mac OS X. There’s no need to prepare yourself for mastering a difficult program – Picture Collage Maker is user-friendly and simple-to-use. There are hundreds of templates, photo layouts and backgrounds available to suit every snapshot collection, and you can add text, colour and change the size of your photos with ease. Whether you’re a collage-expert or a beginner, this program will allow you to produce beautifully stunning collages with just a few clicks. This is another program offered by PearlMountain and again provides wonderful simplicity to making photo collages. There are plenty of templates to suit every taste, or you can start from a blank sheet. Best of all, CollageIt will automatically make the collages for you and provide you with a real-time preview before you share your creations with friends and family. This is suitable for any experience level and is ideal for transforming your stacks of photos into gorgeous collages in seconds. No computer skill or flair for design is necessary for SnowFox’s Collage Maker. This program can be easily mastered by anyone with a collection of photos and couldn’t be simpler. 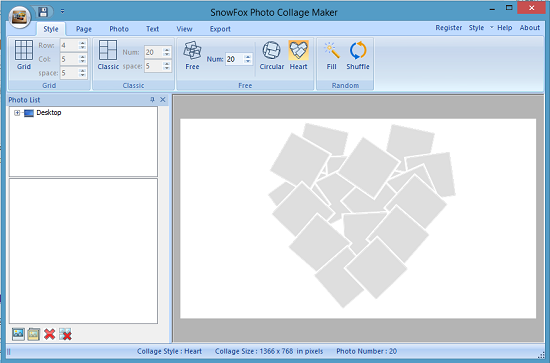 To make the process quick and easy, SnowFox Photo Collage Maker provides a selection of 5 templates and allows you to import photos to drop them into the template of your choice. Backgrounds can be customized to make sure your collage stands out, and you can even add captions to the photos to make the final piece wonderfully memorable. Your masterpiece can be printed out or shared with family and friends, or can be set as your computer wallpaper. Smilebox provides a wonderful variety of photo collage designs and there are different themes ranging from Facebook covers and holidays to weddings and school. Downloads are free and rather than just creating collages out of photos you can also add videos and music to make your collections more personal and unforgettable. 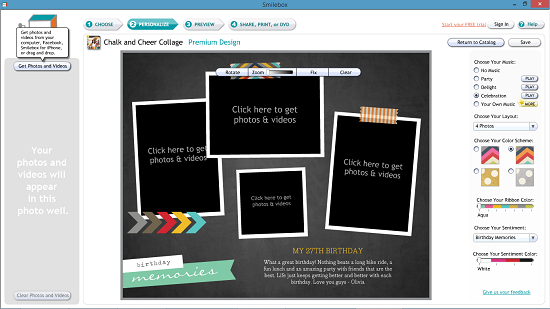 The process of creating your collage takes only minutes, but with Smilebox you’re guaranteed to finish with a delightfully charming and high-quality product. Probably the best shape collage maker you can find. It is extremely easy to create a gorgeous shape collage with this software – just make sure you have lots of photos (preferably more than 100 images), to create the perfect shape collage. Not enough photo to fill up the shape? You can add photos from the web by connecting to your social media accounts or using their built-in search engine, where you can search photos from Google, Instagram, Twitter, Flickr, Tumblr, and more. Then, you can adjust or change its shape, spacing, size, angle, rotation, border, etc., before saving it in JPEG format. Lastly, Shape Collage also has a collage maker app for iOS devices. Try it out on your iPhone or iPad! This popular program allows you to create fun and interesting design layouts for your collage. With clear command icons and logical pathways, Aleo Photo Collage Maker is simple to use and easy to navigate through. Choosing photos from your personal collections is quicker thanks to the thumbnail display of each photo in your folders and once you’ve picked your photo, all you need to do is drag and drop into the clearly labelled spaces that the program provides. 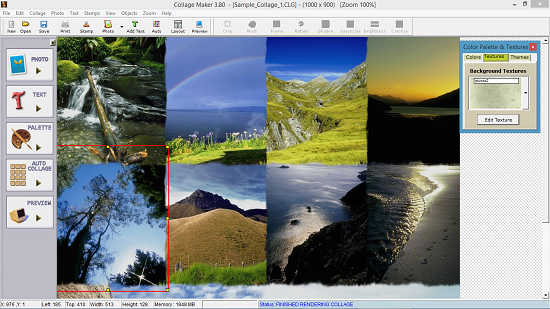 Making collages is effortless and quick with Galleria Software’s Collage Maker. Unique effects and borders can be created using a huge assortment of masks, and you can even add shadows, halos, colors and rotate your photos to create a completely distinctive display. This program provides holiday theme templates and rubber stamps for perking up your collages, and once you’ve finished creating you can share your final design by email or even use it for your desktop wallpaper. 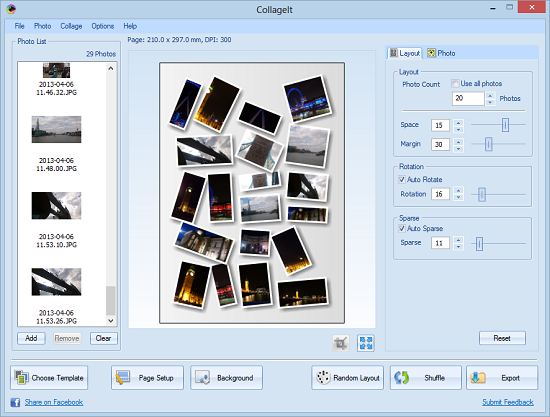 With all of these options for making pictures collages, what are you waiting for? Check out PhotoSpills. 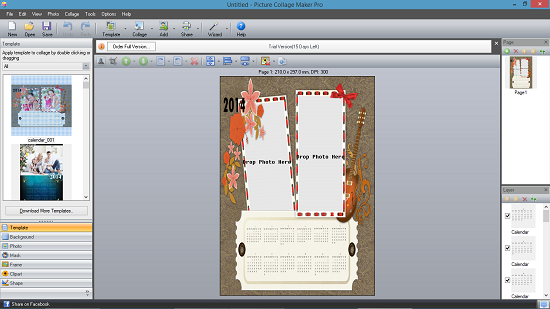 It is free collage software and has great features. Great list, Shape Collage seems pretty interesting. I think PhotoVideoCollage should also be included, because it lets you create not only photo, but also video collages. The app is free, so who’s interested can check it out on photovideocollage.com.